The 12-month Urban Systems program was an ideal opportunity for Syed Bukhari to gain a Canadian perspective on urban infrastructure systems and deepen his technical, leadership and project management skills. 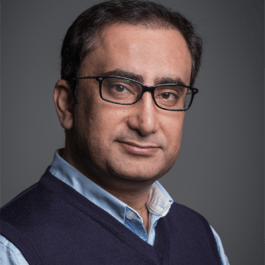 With a degree in civil engineering, an MBA and more than 15 years of international experience in construction and infrastructure projects, Syed Athar Bukhari came to the Master of Engineering Leadership program with considerable – and impressive – experience. Yet he wanted to take a year away from work to deepen his technical and business skills within a Canadian context. About 60 per cent of the MEL in Urban Systems classes explore urban systems from the perspective of both engineering and planning, with courses taught by faculty from the Department of Civil Engineering and the School of Community and Regional Planning. Two courses that stood out for Syed were asset management and urban systems engineering. All technical classes were built around an industry-centric approach, he says. In one class, students developed a planning and design framework for a new carbon-neutral community just outside downtown Edmonton, Alberta. Other classes saw Syed working with his peers on asset management for the District of North Vancouver and developing multimodal transportation concepts for the City of New Westminster, BC as part of its Intelligent City initiative. One of Syed’s goals in taking the MEL was to familiarize himself with urban systems issues in Canada. He received permission to take three engineering electives to deepen his technical knowledge in project management, virtual design and construction (BIM/REVIT) and legal aspects of project and construction management. “These were important courses for me to expand my knowledge of the legal aspects of engineering management and to familiarize myself with Canadian case studies and examples,” he explains. Although Syed came to the program with an MBA in finance and was familiar with the language of business and management, studying the foundations of business alongside other students from the MEL program offered new perspectives. Syed was approached by a recruiter before he graduated, and he landed a position as a construction project manager with Freedom Mobile (owned by Shaw Communications). His sense is that many public and private sector organizations are looking for people with technical and business skills.